Comfy &amp; Cozy Cassill Court! 4 Beds 2 / 1 Baths 1 Partial Bath 2,350 Sq. ft.
District UPPER ARLINGTON CSD 2512 FRA CO. Description: Open sunday, 10/7, 1-3! Outstanding residence in beautiful neighborhood. Walk to thompson park and library from this quiet cul de sac location. 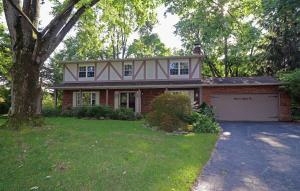 Gorgeous, privacy fenced, wooded yard with large deck, pergola & fire-pit. Main level features formal living & dining rms, kitchen with granite counters, stainless steel appl & adjacent dinette, cozy family room with brick front fireplace. Upper level owner's suite with walk-in closet, 2-room bath with glass door shower. 3 additional brs, and full hall bath with double sinks. Hardwood flooring throughout. Basement with rec room area, laundry hookups & storage space with built-in shelves. 2 car garage with door to yard. Back yard storage shed & lean-to building with storage space & workshop. Welcome home!